The former heavyweight champion spoke about his troubled childhood, his mother’s addiction to drugs and his own struggle. Later, in an interview, he said that despite being sober for four years, he was tempted all the time. The Essex County program has 600 participants, including 159 who joined this year In addition to treatment and rehabilitation, participants must also earn their GED, maintain a job and show they are paying off any bills or any outstanding child support. Mike Tyson is the former undisputed heavyweight champion of the world and holds the record as the youngest boxer to win the WBC, WBA and IBF heavyweight titles at 20 years old. 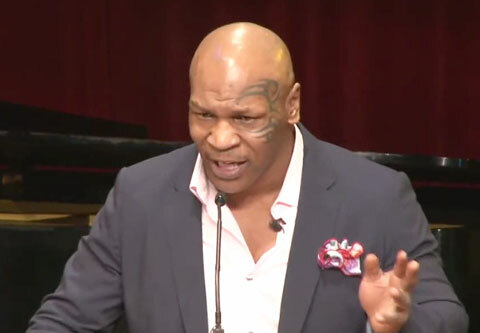 If you would like to book motivational sports speakers or athletes like Mike Tyson for a speaking engagement, guest appearance, product endorsement, charity fundraiser or special event, contact Mike Tyson booking agent for speaker & appearance fees or call 800.966.1380.